Maybe you were born to Christian parents and raised as a Christian. Or maybe you are just a part of a Christian nation. You might have attended church regularly, or maybe just on special occasions. If asked, you say that you believe in God, but you really never thought about what that means exactly. You are a well-educated person who accepts the idea of Biblical miracles, but only the more “reasonable” ones. You have read some of the Bible, mostly just parts of the New Testament, but never committed to reading the Bible cover to cover. You are a good person who admires the many “Christian values” as demonstrated by Jesus Christ. But something does not feel right. You see a world where little bunnies burn to death in forest fires, and wonder why an all good and loving God would allow such a thing to happen. You pray to God and you realize that sometimes your prayers are answered, and sometimes they are not -- just as if you didn’t pray at all. In fact, the more you look around, the more you see a world absent of this perfect image of a perfect God. As much as you want to avoid critical thinking and “just let go and have faith”, you find that you cannot believe in something contrary to your logic and reason — no matter how much you want to. This might lead to feelings of guilt, insincerity, and/or hypocrisy. Yet you just can’t imagine living life without God, and you don’t have to. When you start asking serious questions about God and religion, you begin to see through the stories of people living inside the stomachs of big fish, 900-year-old men, and bodies coming back to life after three days, and understand how man created God, and not the other way around. By daring to question “sacred” religion, challenging your childhood beliefs, and risking eternal damnation (okay, so there might be a minor side effect to reading this book), you will discover an appreciation for religion on a new level, as well as a renewed appreciation for the human race. 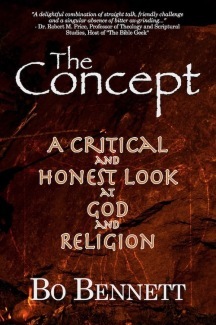 The Concept, edition one, had the subtitle "An Introduction to Christian Nontheism", and had three extra chapters focusing on Christianity and how one can still remain Christian. In the second edition, I decided to abandon this concept as I found it was just too much of a stretch to expect anyone to remain Christian and reject the supernatural. "A delightful combination of straight talk, friendly challenge and a singular absence of bitter ax-grinding... he shows in plain-spoken, engaging prose how his view (and mine!) just makes better common sense. I just love the section on heaven! This book is quite and achievement. Read it!" Dr. Robert M. Price, Professor of Theology and Scriptural Studies, Host of "The Bible Geek"